Good evening fellow scrappers! Today I have a page that up till now is up there amongst my favorites. I just love how it all came together and the expression of my son at just 2 days old here laying in his daddy's arms is priceless to me! These photos were taken by a photographer onsite at the hospital where my son was born. She managed to capture this fabulous shot which is very close to my heart. Mind you, this page was done going on 2 months ago now--I just haven't found the opportunity to post it till now. 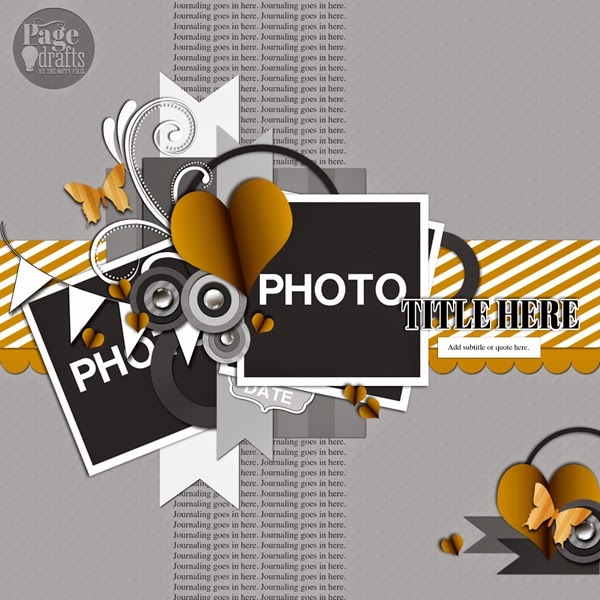 This page was created as a submission for Emma Stafrace's 'Love is Everywhere' challenge that was going on over at the Page Drafts blog for the month of February. This is the sketch I chose from the several that Em provided. I followed this one pretty closely since I liked all of the elements that Em included in the sketch. 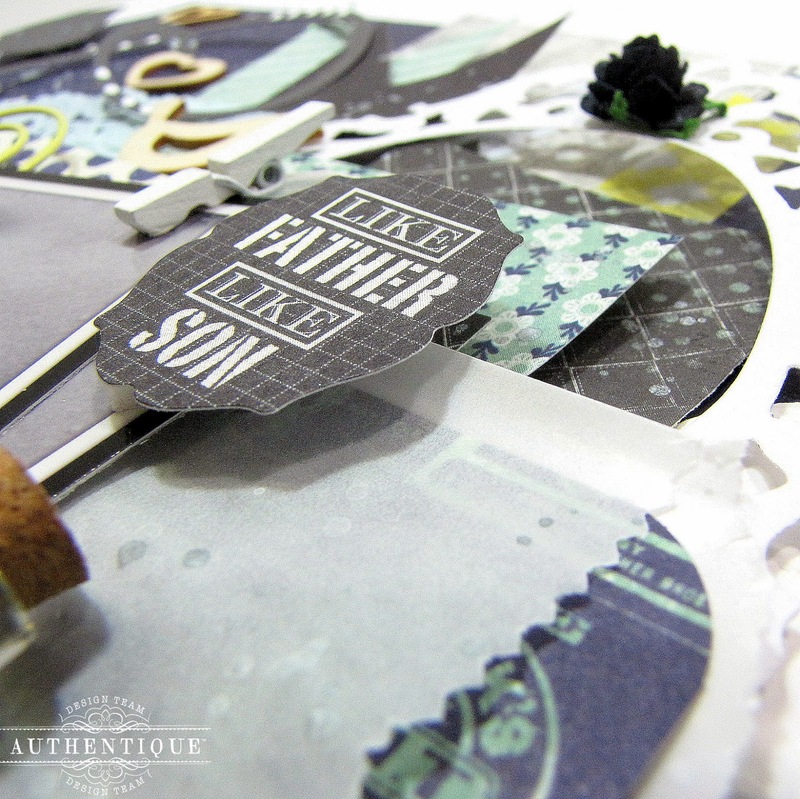 All the papers & paper based embellishments are from Authentique's 'Suave' collection. 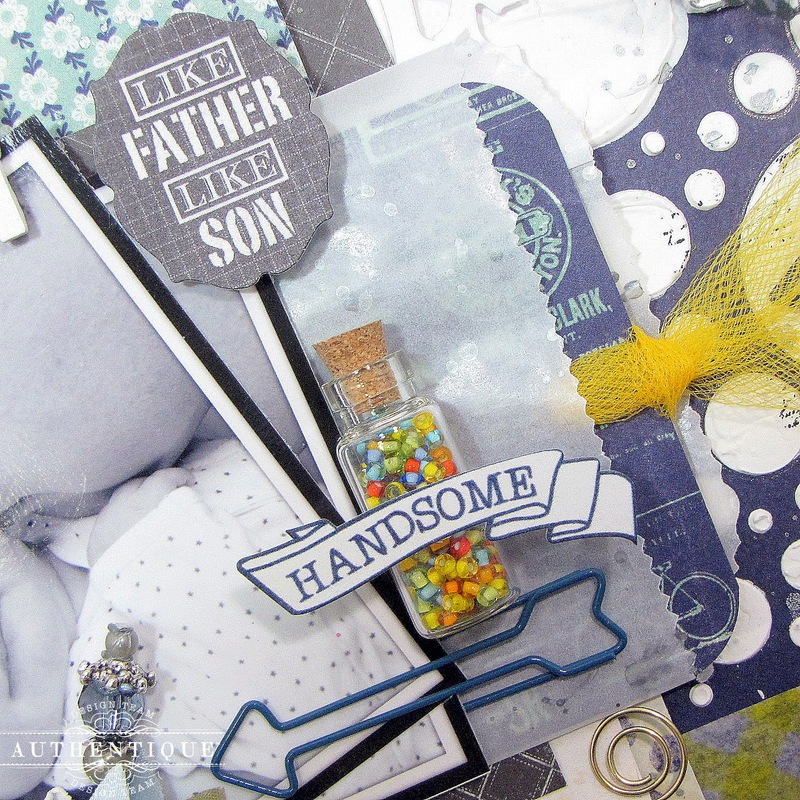 The elements, colors & designs from this collection are perfect for masculine/boy themed pages. With a Prima stencil (Bubbles by Finnabair) & texture paste I created the circles in the background...I added additional dots with a white gel pen. These transparent butterflies are the latest addition to my 'Glass Butterfly' collection found in my Etsy shop. These would be No. 14 in the collection. I have these & many more butterflies in all shapes & colors in my shop. Feel free to visit my shop here if interested. In this photo you can see that I highlighted a few of the circles with a silver gel pen to make them pop out a bit more. Woo-Hoo! 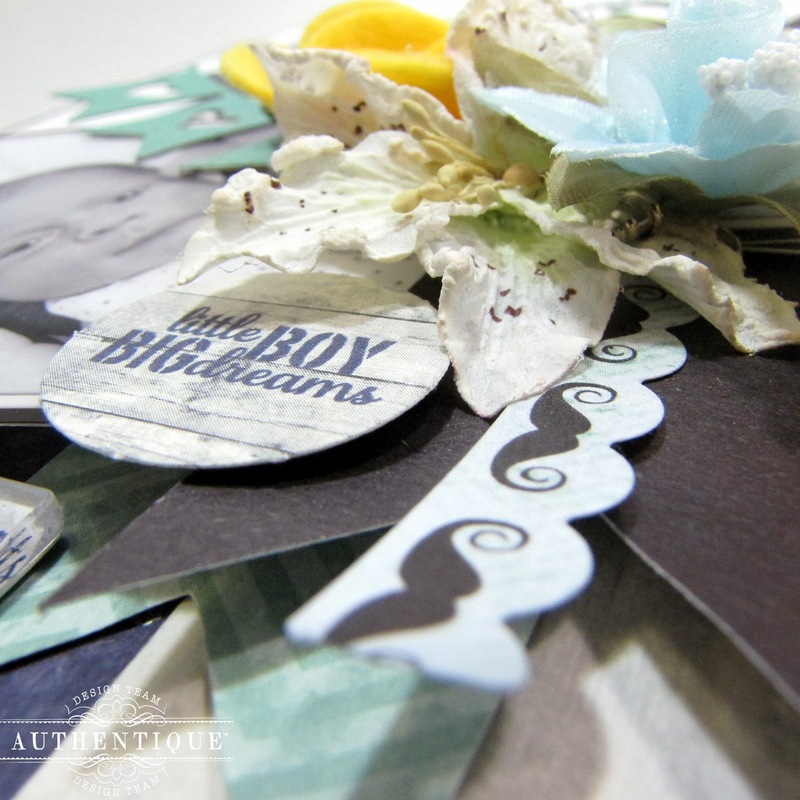 I finally found a chance to use up a few of these Tim Holtz fragments that I've had in my stash since the beginning of time! :-) With a bit of Glossy Accents I adhered the fragments onto a few sayings from the 'Suave' collection in order to make them stand out a bit more. My journaling which is a must on all my pages is stored in this white glassine bag. I used a tag from the 'Suave' collection to hold my journaling & tucked it into my bag. I filled a tiny glass vial with multi-colored seed beads & adhered it to my glassine bag. The light blue organza ribbon star flower are embellishments from my own stash. I have these & a few more in different colors available in my Etsy shop. Feel free to visit here if interested.